Combine cinnamon, vanilla, cornstarch, peach nectar, and juice in a saucepan over medium heat. Stir constantly until mixture thickens and bubbles. Add sliced peaches to mixture. Reduce heat and simmer for 5 to 10 minutes. Lightly spray an 8-inch-square glass dish with cooking spray. Pour hot peach mixture into dish. In a mixing bowl, combine the pancake mix, flour, sugar, and melted margarine. Stir in evaporated milk. 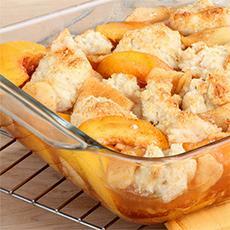 Quickly spoon this mixture over the peach mixture. Combine nutmeg and brown sugar in a small bowl. Sprinkle mixture on top of batter.